Bob-Lo Boat S.S. Ste Claire rests at her new home in the Rouge River at the Dix Lift Bridge. 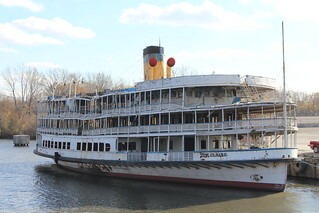 This boat until the early 90's hauled many Detroiters to the amusement park on Bob-Lo Island, now a housing development. Most of my family has probably rode both her and her sister the S.S. Columbia, and for the first time in 20 years, she'll be undergoing restoration here in Detroit.